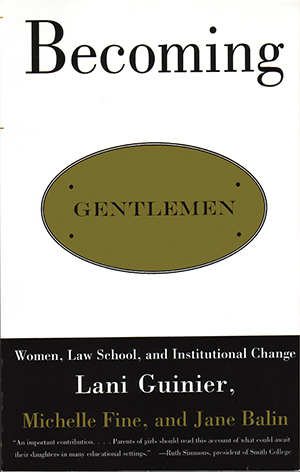 As a student at Yale Law School in 1974, Lani Guinier attended a class with a white male professor who addressed all the students, male and female, as “gentlemen.” To him the greeting was a form of honorific, evoking the values of traditional legal education. To her it was profoundly alienating. After interviewing hundreds of women with similar stories, the authors conclude that conventional one-size-fits-all approaches to legal education discourage many women who could otherwise succeed and, even more, fail to help all students realize their full potential as legal problem-solvers. In Becoming Gentlemen Guinier, Fine, and Balin dare us to question what it means to become qualified, what a fair goal in education might be, and what we can learn from the experience of women law students about teaching and evaluating students in general. Including the authors’ original study and two essays and a personal afterword by Lani Guinier, the book challenges us to work toward a more just society, based on ideals of cooperation, the resources of diversity, and the values of teamwork.